I met the Christmas Bird Count group at the Highland Center at 7:30 this morning. Four teams would each take different routes to count birds today. I joined Craig and his wife Jane to hike up to Webster and Jackson. This was the most challenging of the options, which is why I was interested in doing it. We started with a nice walk around Saco Lake, stopping at intervals to listen and look for birds. 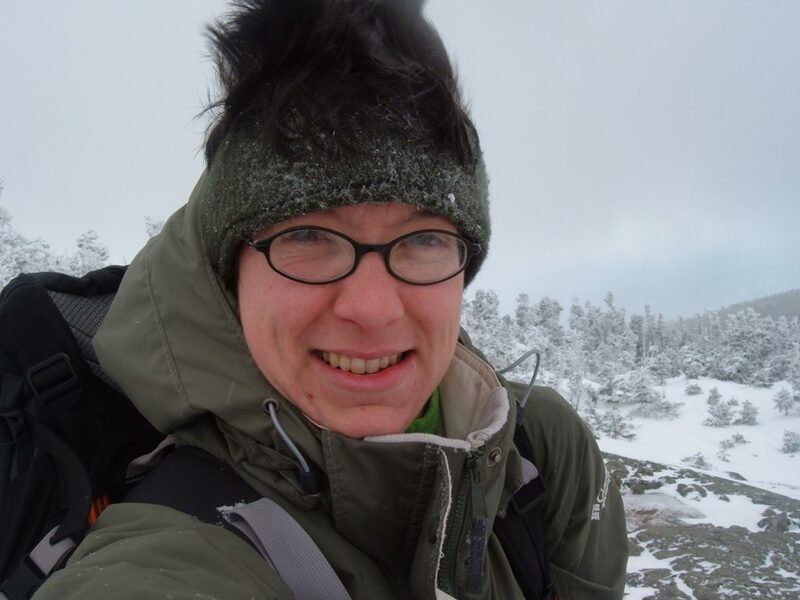 This was Jane’s first time on snowshoes, which was another reason to keep a gentle pace. Right from the start, the birding did not seem too promising. The slow starts and stops were unusual for me, so I wasn’t dressed warmly enough to stay comfortable. By noon, we still hadn’t reached our first peak. I knew we needed to pick up the pace. Climbing up to Jackson, we took turns breaking trail. Now I was warming up! Trail breaking was hard work. The snow just seemed to get deeper and deeper. The snow was loose and unconsolidated in some places. In others, there were steep slabs with nothing for the crampon points of the snowshoes to grab onto. I had to throw my poles up ahead of me and brace myself with my belly and knee on the rock. Poor Jane with her borrowed recreational snowshoes was having a really hard time with all this. But, we persevered and made it above treeline. A quick sprint up through gusty winds brought us to the top of Jackson. I stopped for a few photos before heading down Webster Cliff Trail. There were no views where there should have been because of all the clouds. This has become something of a theme for my winter hikes and it’s not even officially winter yet! Tired and exhilarated, we pushed on to Webster. No birds. We had seen three chickadees in the first hour of our hike but nothing since. We stopped for a food break near the W-J trail junction. I was starving. The descent wasn’t quite as easy as I expected. Coming down from Moosilauke last weekend was cake! Today, it was far from. We all took turns falling down the mountain. In some places, it was the best way to descend. I’m sure glad I wore ski pants. There were some pretty tough blowdowns to get around near the river. We had to search for the trail in some spots. Morale began to sink. We continued slowly and quietly until…a female downy woodpecker! She was our fourth and final bird for the day. We hiked out in the dark and met up with the group for dinner afterwards. All in all it was a good day, despite it being longer than I had planned. But, I had everything I needed: food, clothing, water, light source, etc. I just might be getting good at this. 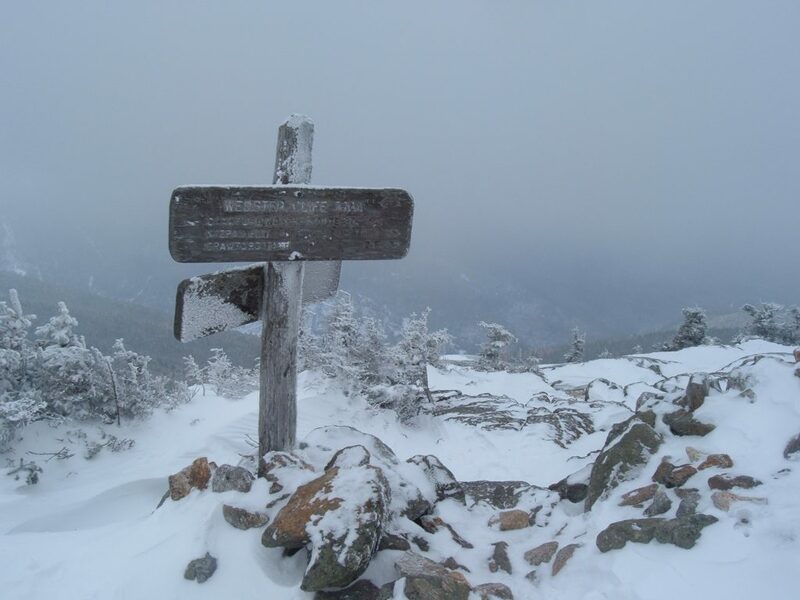 This entry was posted in Hiking, New England and tagged hike366 on December 17, 2005 by Jess B.